A New Face for Prime Time. In 2015, we teamed up with regular partners Trasaterra and Field & Post to completely overhaul CNBC’s banner site for its primetime shows–CNBC Prime. The project was ambitious in size and scope, with BFC working to make the site more lightweight while packing it full of dazzling new features. 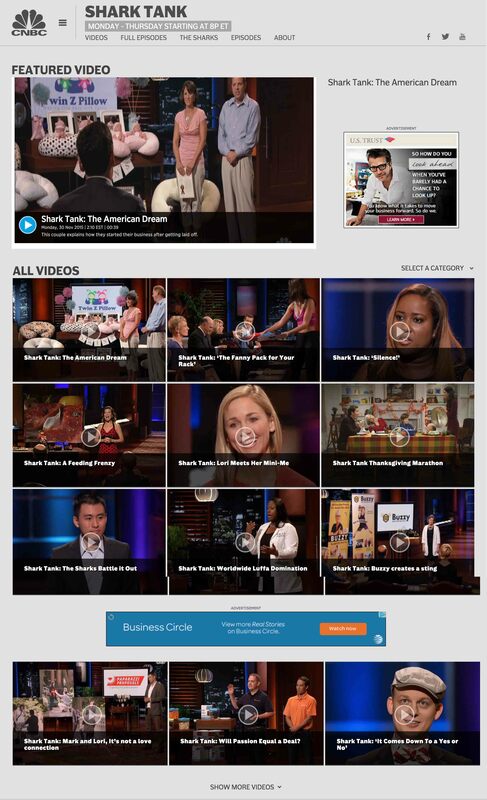 The relaunch in November 2015 brought an entirely different feel to the site, ultimately making CNBC’s web presence a quicker and easier one to navigate for its enormous audience. CNBC Prime’s homepage offers multiple entry points into its content, with several carousel sliders providing key links into its current output. The page is scaleable for mobile devices, with a custom slideout menu appearing on smaller widths, and content stacking through the bootstrap framework for maximum ease-of-use. The page brings in an important scheduling feed for quick reference to show times, and a Latest section to attractively display all the most recent content on the site. We manipulated the WordPress multi-site structure to draw in content from all the show sites collected under the Prime umbrella, carefully making sure no slow-down occurred during key database querying. By night, CNBC Prime is an entertainment network with a programming slate that is an extension of CNBC’s distinct brand. The entertainment focused block in primetime includes programs such as Shark Tank, The Profit, Jay Leno’s Garage, West Texas Investors Club, Restaurant Startup, American Greed and Secret Lives of the Super Rich. Each individual show site within the WordPress multi-site structure features a video page, aimed at showcasing up-to-the-minute video clips from past and present episodes. We made the page fully customizable so the Prime team could select featured videos, filter the page by category-based dropdown menus, add Ajax-based ‘load more’ functionality, and integrate advertisements in unique and striking ways. Like the rest of the site, these pages scale down for mobile and tablet sized screens to provide a seamless viewing experience, much like the shows the video pages are showcasing.